This post is part of Our Journey to Become Debt Free series. To see the others, please click here. Ahh! Like I said in my very first post of Our Journey to Become Debt Free, our goal is for me to be a Stay at Home Mom. So guess what, I’m now home full time with my 2 year old ball of energy. Of course, since my Etsy shop Aqua Anchor Designs has been doing so well, especially during the holiday rush I just made it through, I’m more like a work at home/stay at home Mama. But you get my point. It’s surreal reaching this goal we’ve worked toward for nearly 2 years though. 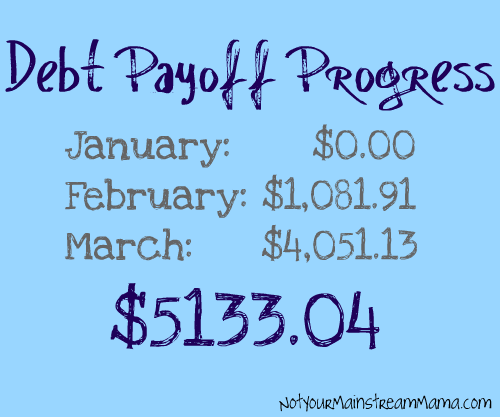 In 23 months, we paid off $23,491.25 in debt! So surreal, I was afraid to quit my job. I kept telling Clint, but what if this, or what if that. I’ve told you, I’m a worrier. But now I need something new to focus my busy mind on. And I’m a goals kinda gal. So we’ve decided to not let our momentum down and keep trucking it and set some new goals for ourselves. I mean, really, the last two years has not felt that depriving to us. We still eat out, more than we should, and we’ve been on two weekend trips since then. We want Baby Girl to be born debt free. We need a Fully Funded Emergency Fund. We want to do some maintenance/upkeep on our home. We may want to pay extra on our mortgage and/or save up for a downpayment on a bigger home. We may want to save up for a vacation soon. So we know these things now… we just have to make a plan of what order we want to do them in and how we’re going to do them. months will build up enough savings to make that possible. Once that’s done, we’ll most likely focus on our Emergency Fund. Do you set financial goals for yourself/your family? What do you do when you reach them: celebrate, make new goals, etc? This is the 12th post in Our Journey to Become Debt Free. To read the others, click here. November was a great month. I didn’t think it would be, but it ended up being pretty eventful in Our Journey to Become Debt Free. We were waiting for Lucas’ hospital bills from October to be finalized and I was in the middle of opening my Etsy store. Both of those equate to a lot of nervous anticipation and money money money. 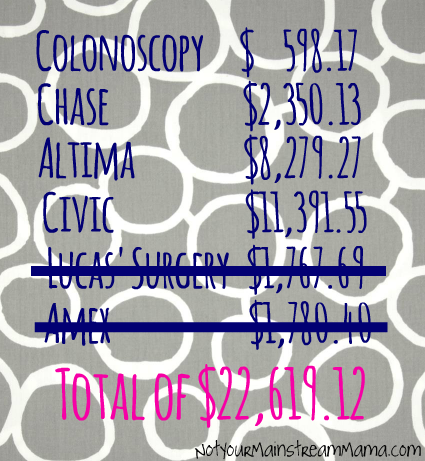 At the end of October, Lucas stayed overnight in the hospital with Croup. He recovered very quickly, but it was a very scary ordeal for us. I was also terrified of receiving the hospital bills. Even with insurance, medical bills make me sick to my stomach. Throughout November, I signed on every few days to our insurance’s website and looked at what claims had been filed. At one point, 2 claims for some doctor were filed for a total of $78.00. The insurance discounted and paid and we were left with $13.73. Then, the pediatrician’s claim was filed for $249.00, processed and we owed $216.23. It would have been less, but we still had a $500 deductible left to satisfy. Next, the Emergency room company filed for $617.38, insurance processed and we owed $274.37. At this point, at a total of $504.33, our deductible was covered but I knew the hospital itself still had not filed a claim. Finally, the week before Thanksgiving the hospital’s claim was filed. It was a whopping $10,080.98! I estimated we’d have to pay about $1,000 of that and the $504.33 for a total of around $1,500. I had not made most of our Snowball payments in October and did not make any in November. I carried over $430.53 in the Snowball budget category from October and set aside $256.76 in November for a total of $687.29 to go towards the medical bills. Then on the Friday after Thanksgiving, I looked and we only owed $322.91 to the hospital!! 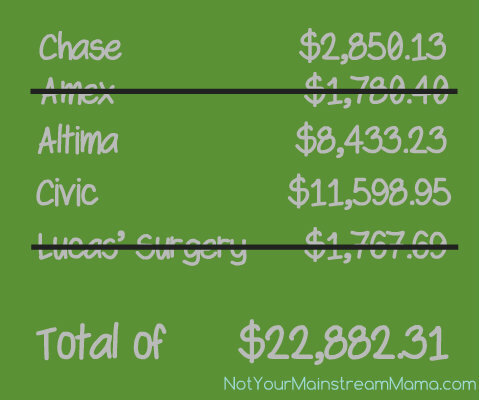 With the other claims and the hospital, it was $827.24 for his ER visit and hospital stay. A little over half of what I thought it would be! 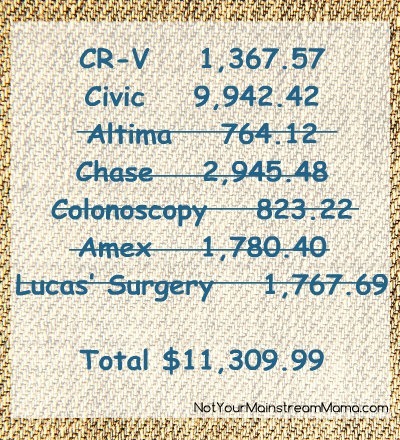 I decided to use the $430.53 from October to make a payment on the CR-V and carry the $256.76 over to December for Lucas’ medical bills. Another great thing happened; I received my final refund from the OBGYN’s office for overpayment for my prenatal care from Lucas. It took over a year, but at least I got it. That was another $420 to put towards the hospital bill. We spent $393.54 on groceries in November, which is great! I blew my $100 Etsy/Blog budget though, coming in at $176.94. Yes, you should go to my Etsy store and buy something to help me make it up. Just kidding, kinda..? We made a goal to pay off the CR-V before the end of the year. Although the $827.24 hospital bill was less than I thought it would be, it definitely threw a wrench in those plans. I’m not sure we’re going to make it. We’ve caught up the Our Journey to Become Debt Free series! 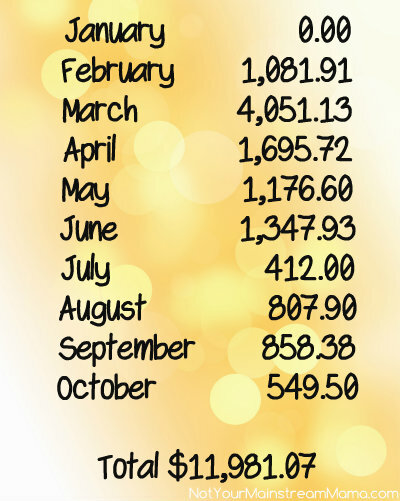 Starting in January, I will post a summary of our debt payoff activities for December and will continue to do that monthly for the month before. Right now, I have December’s post scheduled for January 3. Have you ever been pleasantly surprised by a medical bill being LESS than you thought it would be? Or started a new endeavor, Etsy for me, that cost you to start up and you didn’t see any results at first? This is the fifth post in Our Journey to Become Debt Free series. To read more of them, visit this page. In April, I had to pay the final $50 to close out our contract with Dish Network now that we had returned all of the equipment to them. Since I had decided I wanted to keep groceries around $440, it had pretty much been a breeze. In April, I spent $442.80 on groceries. Of course, I estimated what I really thought we could do, but I was very pleased with our ability to stay within the $440 budget. We added another line item to our budget in April. It’s what we refer to as “Blow” money. Basically, it’s a weekly or monthly allowance of a certain amount that you can kind of spend on whatever you want. We were already spending the money, so we hoped that by creating a budget item for it and limiting it to a certain amount would help with some of the frivolous spending. We decided on $160 for the month, which was $20 each per week. The stomach issues I went to the doctor for in March ended in a Colonoscopy in April, so we paid $598.17 towards that, mainly using the leftover $515.74 from March’s Snowball. We were also able to make a $664.27 payment on the Chase and redeem points for a $25.98 bill credit. That brought our Chase down another $690.25! Isn’t it crazy?! A few months earlier we were adding to our credit card debt every month and now we’re making $500 and $700 payments on those credit cards every month! Do you have a realistic budget? Would you benefit from budgeting software like YNAB ($6 off here)? What’s keeping you in debt? This is the fourth post in the Our Journey to Becoming Debt Free series. To read more of them, please visit this page. Like Dave Ramsey says, if we’ll live like no one else now, later we’ll live like no one else. We’re a little bummed right now about our debt payoff though, to be honest. As I mentioned Monday, Lucas had an overnight hospital stay this past weekend. Obviously, I know that it was necessary.. but I feel so defeated. Who knows how many months the bill will add to our journey! I just need to remember to be thankful that Clint has a job that provides such a great insurance plan. Help me remember that when I get the bill, please? Clint gets paid bi-weekly, so twice a year he gets 3 paychecks for me to budget towards one month, instead of the usual 2. March was one of those months for us which meant a nice Snowball. I hit just a little bit under my $440 grocery budget in March, coming in at $438.42. Go me! We used the rest of the tax refunds and some of the Snowball and made a $500.00 payment on the Chase. I also finally went to the doctor to have some stomach issues I’ve had going on for around 3 years looked into, so we had an extra $175 in co-pays. After all of that, we still had another $515.74 to Snowball. But I’ll admit it, I was scared. The idea of throwing every extra penny to debt is hard for someone who has always tried to save, which is silly because what’s the point in building a savings account while you’re building debt on the other side of your finances. But I was scared, so I held onto that $515.74 into the next month. Don’t worry though! We reaffirmed our plan in April and used every bit of it. Come back next week to read about that. Do you have a “savings” and debt? Why not just put that savings onto your debt? What do you think about the concept?